I didn’t realize it before how much I enjoy humour in writing, I am not a historical fiction reader and yes I don’t know about the story of Jane Eyre though I heard the name but not the details. So the story was completely new to me. I guess the paranormal element was introduced in the real story which didn’t feel forced. I love the world building and characters, It is set in PRE-VICTORIAN time and writing literally took me there. It is a type of book which shackles you with the story, I can’t give another example of it despite that I am a few days away of my final exams still one day I stole a few hours and finished it because the story was just stuck in my mind and I was unable to focus on my study. I also don’t read Paranormal stories but this one was FUN, From Jane to Charlotte, From Alexender to Barnwell(I am not good in remembering the names, so If it is wrong, Do correct me and Did I mention how silly and clumsy he was?). I enjoyed each and every character and it doesn’t happen often that all the characters are equally amusing. I believe there were many references I caught a few and enjoyed those, A cameo of My lady Jane’s MCs were also unexpected but made me happy. 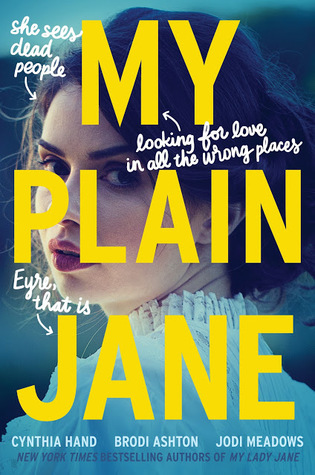 I don’t know why people didn’t like it as much as My Lady Jane, I loved it. I love the original Jane Eyre, and this sounds like a fun adaptation. I loved the first one by these authors and I’m excited to read this one. Sounds like a great adaptation. Fab review. I’ve seen this one posted about a good bit. I’m glad you enjoyed it!